What’s in a name? What does it mean for a map to be titled a comparative? It’s been a while since I discussed the fundamentals of comparatives; this post reviews those but is by no means exhaustive. I have developed a few criteria for comparative views. Comparative views must be: continuous depictions of geographic features, arranged by size (with a few exceptions), to show variation in size with an accurate scale, and usually have a human scale benchmark. 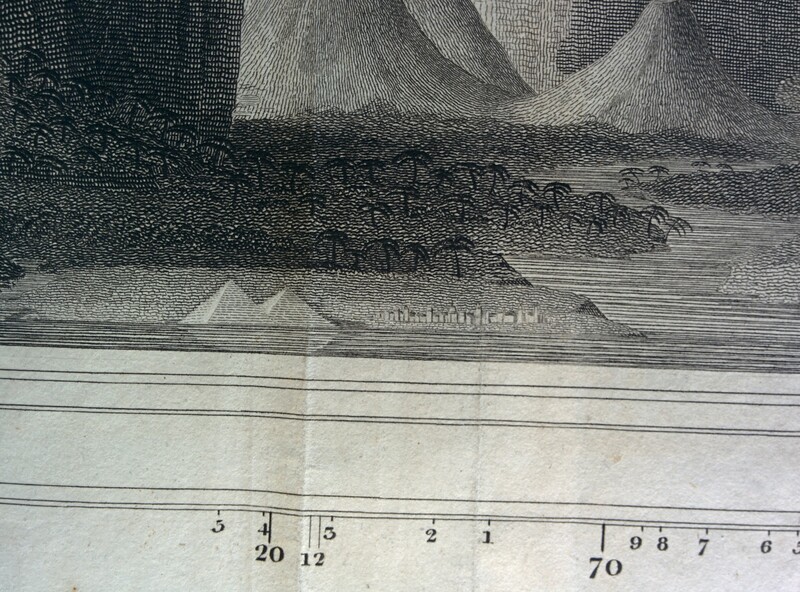 Comparative views were inspired by Humboldt’s 1805 chart. Although it wasn’t a comparative, it planted the seed for visual display of altitude related data visually. 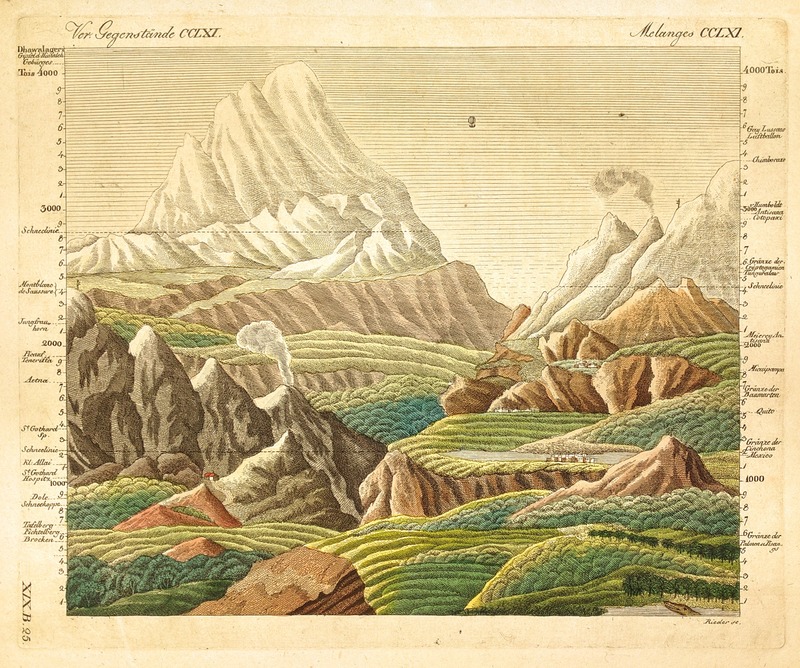 Bertuch was the first to widely publish a comparative, c1810, in the form of a fictionalized landscape. This style gave way to the stylized graph format seen in most comparatives, often found in atlases. By the late 19th century comparative views had fallen out of favor. Comparatives must give the illusion of looking at a scene or “view” of geographic features. The first comparatives did this by taking the form of a landscape. 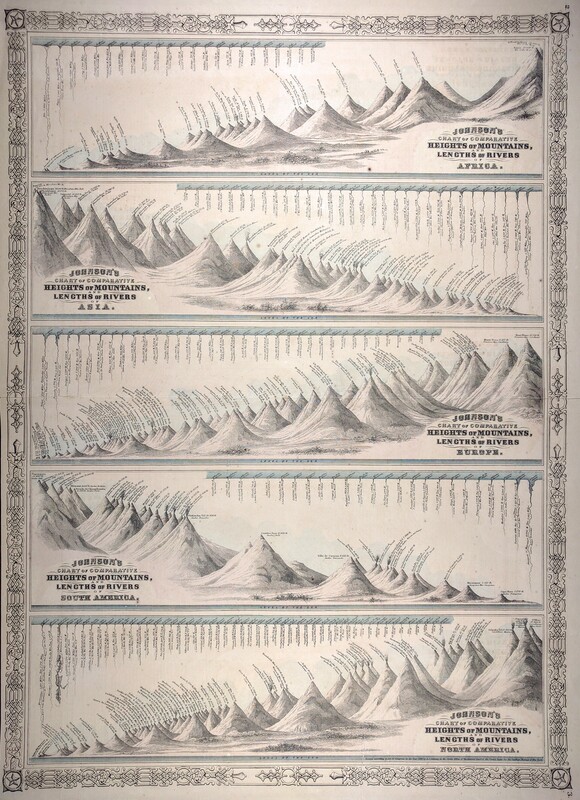 Later comparatives, those of the graph style, achieved this through abstract means where the peripheral attributes of one feature blended into another; mountains slightly overlapped to form a range and rivers drained into a common body of water. Without this unity among the features, the comparison would hardly exist as it would be district images, not inviting the reader to compare them. 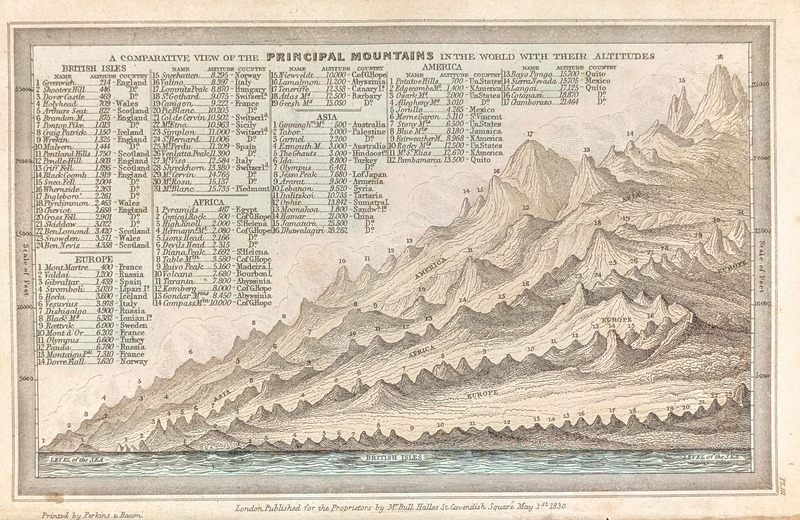 A comparative view is a device to highlight the large (usually, although as always, there are exceptions) mountains, rivers, etc., of the world. As such, they must be laid out so that the reader can readily identify the largest of the objects. Employing (usually) a sorting methodology achieves this. Sorting so as to create a gradient, largest to smallest or vice versa, is common. Pyramid sorting is common with mountains, placing the largest mountain in the middle and the smaller ones to the sides, alternating. Scaling objects on a similar basis is essential to allow readers to evaluate their relative sizes. Heights of very large objects like mountains are hardly meaningful without something of a translation. That translation is achieved through a benchmark that is an intermediary. Many comparatives use the Great Pyramids of Giza as such an intermediary; albeit large, pyramids are still on the human scale to the extent that they were built by hand, people can easily walk around them, and they can be scaled. Despite being on a familiar scale, their size is substantial enough to be compared to mountains. Check out some of the great resources from David Rumsey, Geographicus, and Hautdidier.